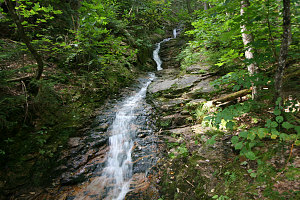 This was originally going to be a writeup and image gallery about a trip in the Catskills in southwest New York state. 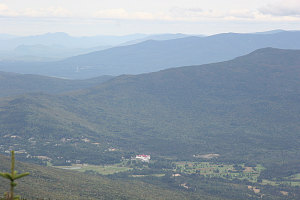 The remnants of Hurricane Ernesto, however, decided to plow into that region on the very weekend that we wanted to go. 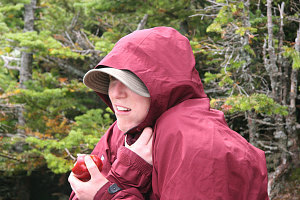 So... in damage control mode, I looked for the closest mountain hike that was going to be dry and was still relatively close. 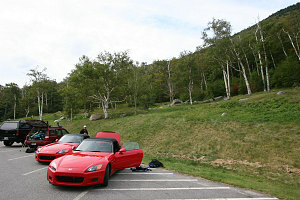 And that spot turned out to be the White Mountains in NH. 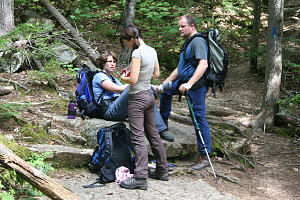 I settled on two or three possible hikes that would suit Luke and Sophie and which were peaks that Jenn and I hadn't yet done. We headed out Friday evening from Ottawa and stayed at a motel in St. Johnsbury, waiting to see what the weather would be like on Saturday morning before making the final decision. 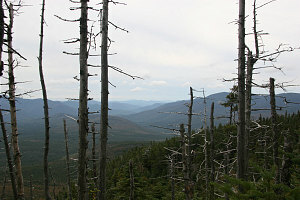 The weather, as it turned out, was so-so: some high clouds and a few lower, summit-cloaking clouds to the southwest. 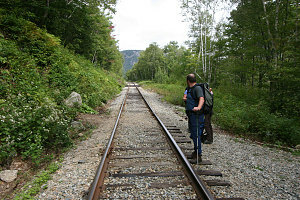 As a result, we stayed further east and north, and chose to do a hike in the Crawford Notch area. 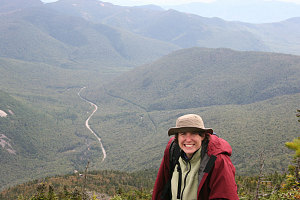 This hike bagged three 4000-footers (Mounts Willey, Field, and Tom) for Jenn and I, and was a reasonable distance, and was something for which we could put two cars to use (i.e. 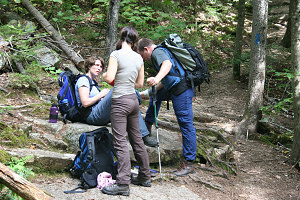 a traverse-like outing). 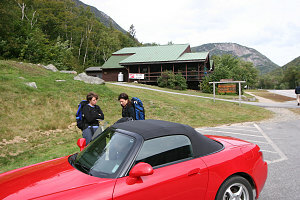 We parked one car at the Kedron Flume trailhead, a little ways south of Crawford Notch, and the other at the notch itself. 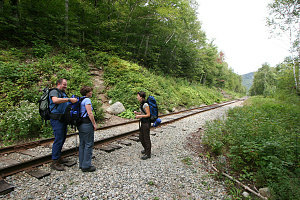 We'd hike up the Kedron Flume trail, intersect the Willey Range trail, hike the entire range trail over Willey, Field and Tom, and then end up at Crawford Notch. 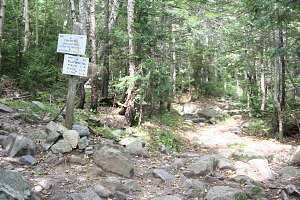 Another bonus: the ascent was considerably more than the descent, owing to the much higher altitude ot the ending trailhead. 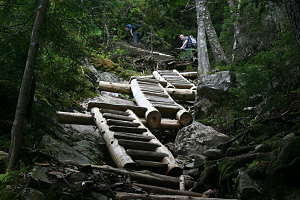 Anyhow, after shuttling the cars into place, we started off up the Kedron Flume trail. 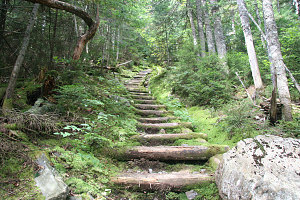 And it starts off steep! 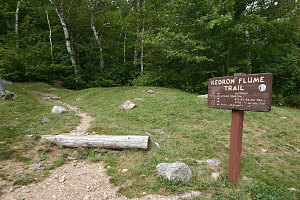 The trail, though steep, is well-graded and switchbacks nicely, up until the Kedron Flume. 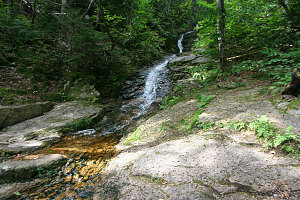 The flume is a pleasant, ordered-looking cascade of water, and a good spot for a rest break. 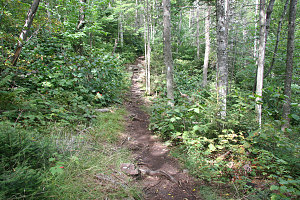 After this, the trail gets steeper and rougher, but it isn't too long before it ends at the Appalachian Trail. 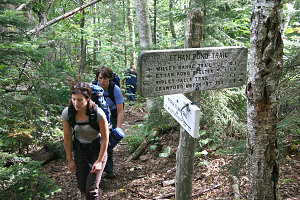 Here, one turns right, and hikes along mostly on the flat, on good trail. 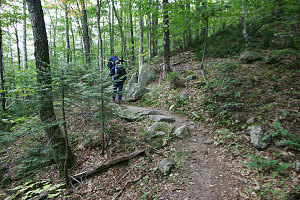 The AT veers off to the left and we continue straight ahead on the Willer Range Trail. 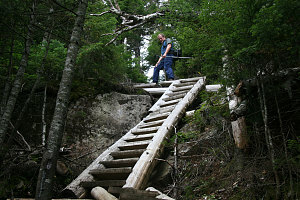 It starts to gradually get steeper, then steeper, then steeper, culminating in a very steep section that is fitted with very large, sturdy, wooden stairs. 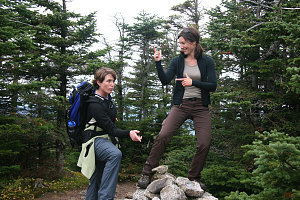 We're very close to the summit of Willey here, and even though there are doubters in the group, we are making excellent time. 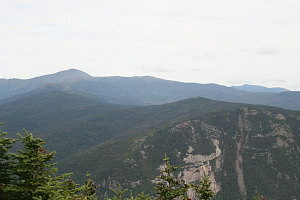 In fact, we reach the summit of Willey about two hours and almost 3000 vertical feet after starting out. That's a pretty decent clip! 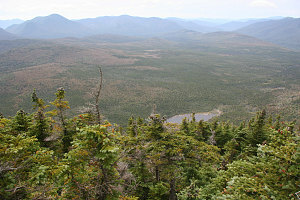 There is an excellent lookout to the east and south on Willey, and because we have some good cold weather clothing with us, we're able to endure the suprisingly brisk and cold wind at the top. 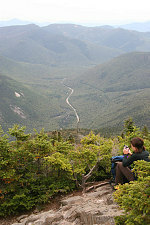 It is cloudy, but the cloud ceiling is very high, and the views are good and far-ranging. 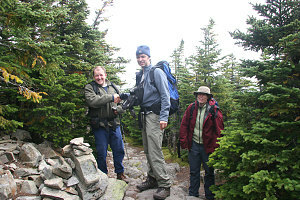 After a snack break at the top of Willey, we head north on the Range trail to the next summit, Mount Field. 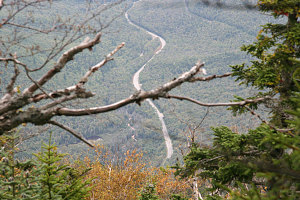 There is little elevation loss between the two, so the going is pretty easy, and it isn't long before we are at Mount Field's summit. 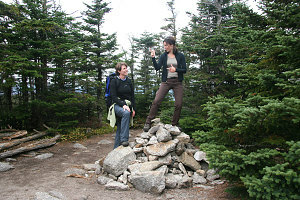 Again, it is treed, but there is an open spot at the summit, and there is a lookout ledge just a few feet away.